the convergence of science, beauty and affordable luxury is now available at Faces of South Tampa! The skinbetter® science team of aesthetic experts developed Restylane® and Dysport®. They have a profound understanding of skin aging and what it takes to help defy the effects of time. A comprehensive approach to age management requires more than aesthetic procedures - it is a commitment to blending procedures, skincare and a healthy lifestyle. 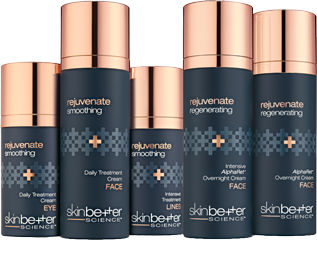 We are proud to welcome SkinBetter to Faces of South Tampa! AlphaRet® Overnight Cream FACE- goes to work while the skin is at rest, to visibly reduce the appearance of lines, wrinkles and uneven skin tone. Alto Defense Serum™ FACE- Alto Defense Serum™ is a breakthrough antioxidant serum that achieves 360-degree skin support against environmental stressors in all compartments of the skin, all in a proprietary and uniquely elegant formulation.